Nanoporous gold, with its large specific area and bio-compatibility, has attracted a great deal of attention for its numerous potential applications in catalysis, sensing, and medicine. Nanoporous gold can be created by a dealloying method, in which the silver from a silver-gold alloy is dissolved in nitric acid. 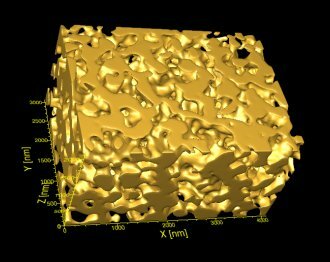 The resulting sponge-like nanoporous gold consists of a network of gold ligaments that are 5-20 nm in size (Fig.1). The mechanical properties of the bulk material can be varied by structural coarsening of the ligament and pore size through heat treatment. To better understand the structural evolution and mechanisms governing the dealloying and coarsening behaviors of nanoporous gold, we studied samples during the dealloying process (Fig. 2) and after a series of heat treatments at various temperatures (Fig. 3) by using the transmission x-ray microscope at the Advanced Photon Source. This instrument provides the capability to image thick (>20 μ:m) samples at high (<40 nm) resolution within the reaction environment in real time. The structures evolve a function of time, during both dealloying and coarsening. 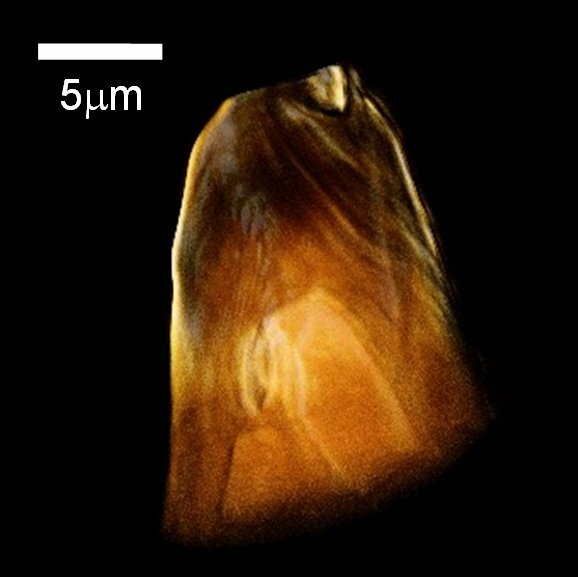 FIGURE 1: A 3D reconstruction of a nanoporous gold sample from TXM tomography. Sample was coarsened at 400oC for 30 min. It shows the sponge-like 3D porous structure . Y. K. Chen, S. Wang, W. K. Lee, I. McNulty, P. W. Voorhees and D. C. Dunand, To be submitted. Y. K. Chen, S. Wang, Y. Chu, W. Liu, W. K. Lee, I. McNulty, P. W. Voorhees and D. C. Dunand, In preparation.